There’s another new free streaming video service on the market, and this one is from Amazon. 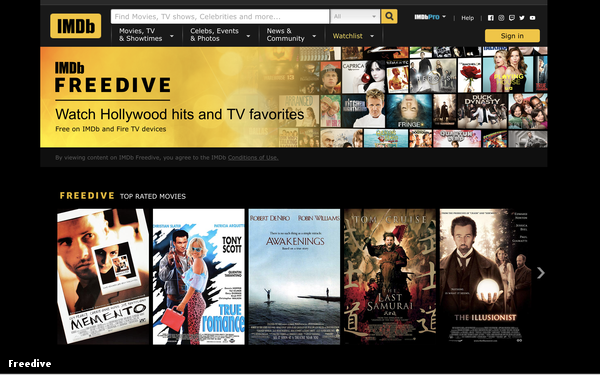 Amazon, through its subsidiary IMDb, has launched Freedive, a free, ad-supported streaming service that will be available to watch on PCs and Amazon Fire TV devices. The company says it will be added to IMDb's suite of mobile apps in the coming weeks and months. The Freedive app will be automatically added to Fire TV devices. The service will include Amazon’s “X-Ray” feature, which allows users to dig into details about the cast, crew, soundtracks and other information. Freedive joins a crowded market, with ad-supported services like Sony’s Crackle and The Roku Channel vying for screen time alongside startups like Tubi TV and Pluto TV. The premise behind all of these services is the same: to offer a free, ad-supported complementary service to premium services like Netflix, Hulu, and HBO. With the market becoming more crowded each day, the challenge to stand out is even greater. Many of these free services also license the same non-exclusive content, making it that much harder. Amazon, with its vast reach and ad-targeting know-how, may be well positioned to take a sizable piece of the pie.